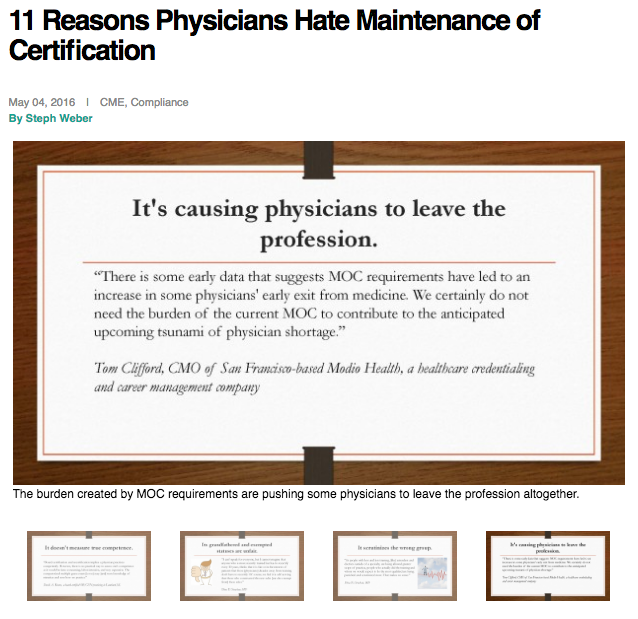 Our very own Dr. Tom Clifford, Chief Medical Offer of Modio Health was recently featured in an article by Physicians Practice titled “11 Reasons Physicians Hate Maintenance of Certification“. The article highlights the pains of Maintenance of Certification (MOC) through the eyes of various doctors and gives a glimpse into why its becoming a highly controversial topic. A little background about MOC – All internists and sub-specialist practicing medicine must remain certified through the American Board of Internal Medicine’s (ABIM) Maintenance of Certification. Physicians must under go MOC every two years and it ties in with the completion of (Continuing Medical Education) or CME credits.